Bondurant Mayor Curt Sullivan briefs the governor. The governor visited the northwest side of Bondurant this morning in the first of three stops around the state to visit areas hit by the Thursday tornado outbreak. Bondurant Mayor Curt Sullivan met Governor Kim Reynolds at the American Legion Hall right across the street from some of the damaged homes. “It’s a tough thing to go through and an emotional time for a lot of people who have lost a lot of things at this point. And thankful that we haven’t had any loss of life in this community for sure,” Sullivan says. Sullivan says he’s pleased to see so many people turn out to help with the clean up. “A lot of volunteers that are definitely helping to try and address this terrible thing that impacted our residents here in town,” he says. 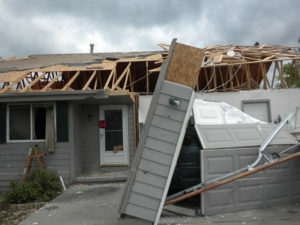 Holly Manning’s home had severe damage. The governor and the mayor walked across the street to see a couple of the homes that suffered damage. 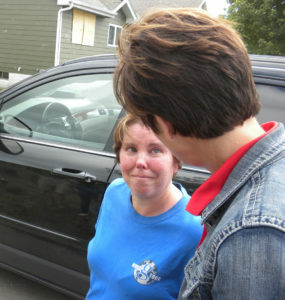 She talked with Holly Manning, who got choked up as she tried to tell the governor what happened. Manning told the governor she was on the phone with her husband and says she didn’t have time to get to the basement. “We survived, we’re safe so,” Manning says. Bits of insulation were blown into the air by wind gusts from the house next to Manning’s as she talked with the governor. She says her husband works for Lowes and the company is providing the supplies they need to fix their damaged home. Parts of the home next door are sitting in front of the garage door and the roof is gone. Workers were erecting a fence around the home to keep people out. A home up the street was a two-story, but the second floor is now gone. Many other homes have tarps on the roof where shingles were ripped off and the windows on many are covered with plastic after being blown out by the tornado. 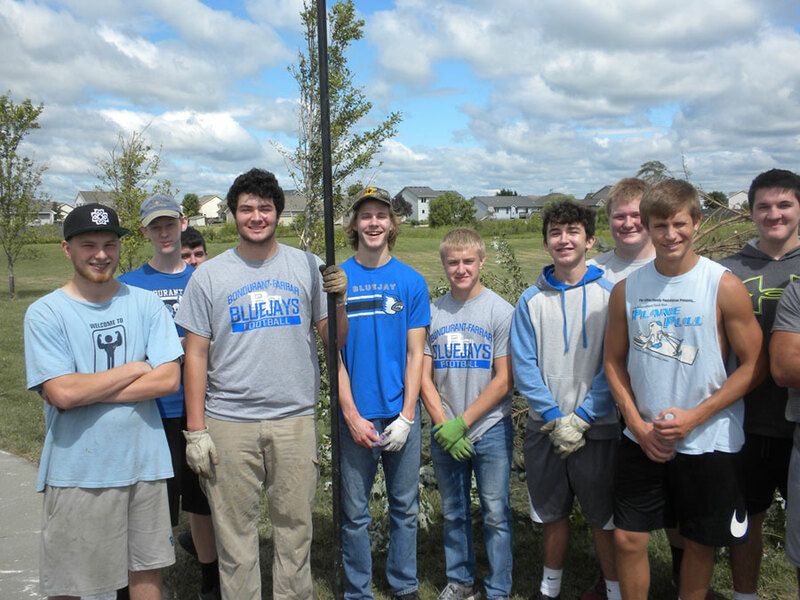 Members of the Bondurant football team canceled their lifting session today to come out and help clean up. Junior Aiden Turner told Radio Iowa he was worried he was going to need help cleaning up his own home. “I watched two of them touch down, — I thought it was pretty weird. I thought my house was going to get sandwiched by the tornadoes — but thankfully it didn’t.” Turner says the residents have been happy to see them help out. 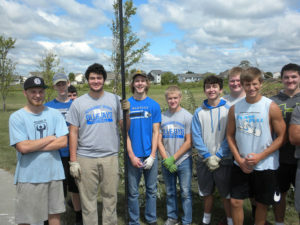 Bondurant football players on storm clean up duty. “A lot of thank-yous a lot of appreciation from them just thanking us for our help around the community,” Turner says. 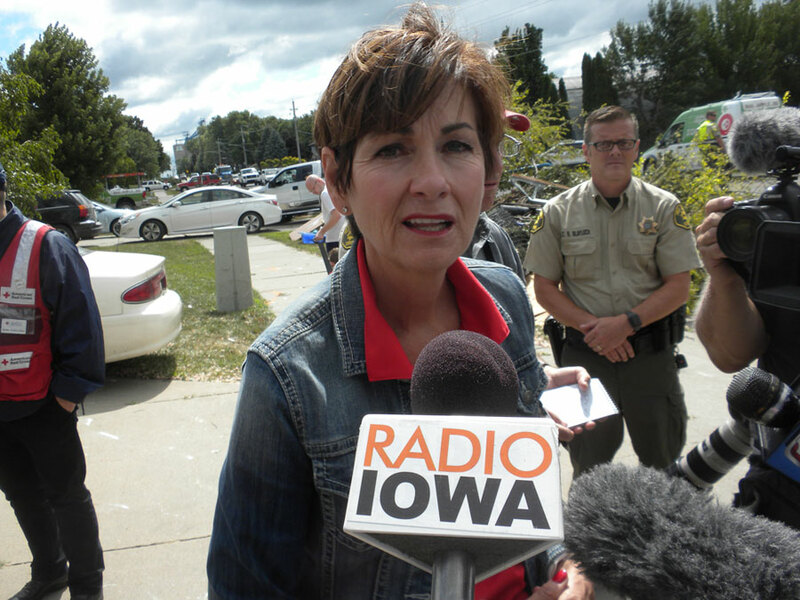 Governor Reynolds says she’s not sure yet the exact total of the damage. She says they do know there is enough damage from the flash flooding earlier in central Iowa to obtain a federal disaster declaration, but that is different from this storm. 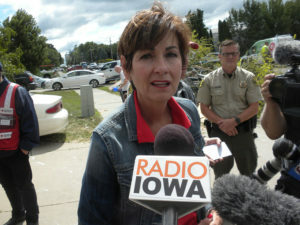 Governor Reynolds talks with the media during storm tour. “With flooding, a lot of times there’s not insurance, and so that will make a significant difference with additional resources that can come into the state,” Reynolds says. She says the good news is the officials who help total the damage for the flash flooding haven’t left the state yet. 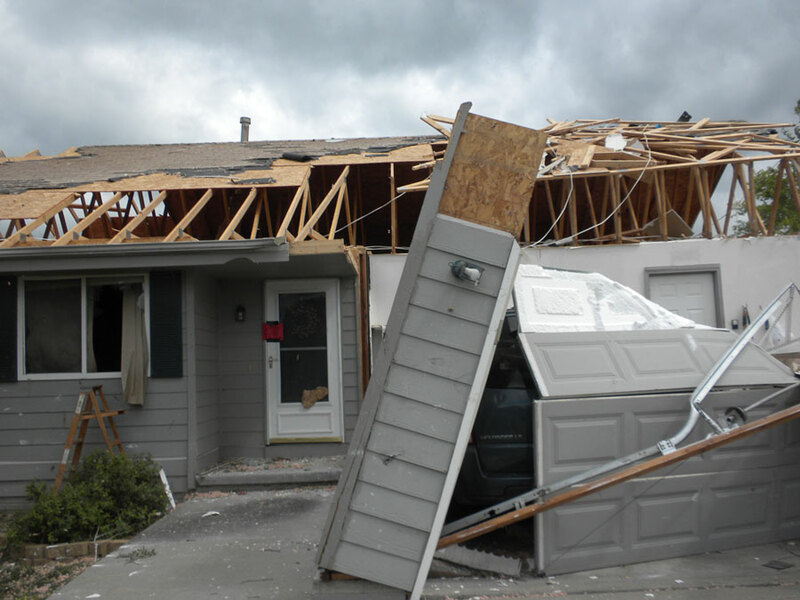 “SBA is actually on the ground right now helping with some of the damage assessment, so we can help collect the data that we need to make sure that we qualify for the federal declaration. They have indicated since we already have them on the ground they will be reaching out to them to have them go into Marshalltown,”Reynolds says. 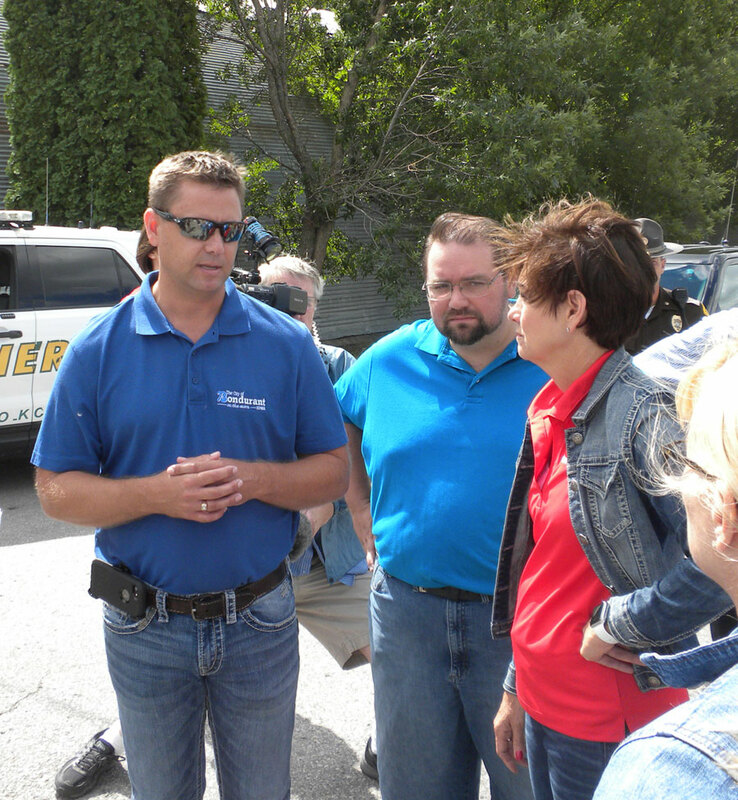 Reynolds left Bondurant to tour the damage in Pella and Marshalltown.